TKTS Booth is a ticket booth where the roof forms stepped seating in Times Square, New York, designed by architects Choi Ropiha, Perkins Eastman and PKSB Architects. Located on Duffy Square at the north of Times Square, the steps are lit from within and draw attention to the monument to Francis Duffy at their base. The project was awarded in the New and Old category at the World Architecture Festival in Barcelona earlier this month. Photographs are by John Saeyong Ra, Emile Wamsteker and Ari Burling. This is the story about a ticket booth that catalyzed the revitalization of Times Square in New York. This surprising outcome occurred through the efforts of disparate stakeholders and the input of three separate architects working independently of each other. The project began in 1999 with an international design competition to re-design the popular TKTS booth at the heart of Times Square. While the competition brief simply requested designs for a small scale architectural structure to replace the existing ticket booth, Australian architects Choi Ropiha reframed the problem as one requiring a broader urban design response to invigorate and provide a center for Times Square. Their scheme for the project emerged from two key observations. The first observation was that the dominant urban experience of Manhattan is the street grid and when the grid breaks, it is typically a green park. Times Square on the other hand is a ‘rare’ condition where the Manhattan grid is prized open to create an urban room. The second observation was that Times Square was a place experienced only from the periphery and this was severely limiting people’s enjoyment of the place. Even though Times Square is one of the world's best known destinations and gathering points, people simply had nowhere to stop and enjoy the show - it was like a theatre without seats. From these observations, Choi Ropiha proposed to use the booth project to ‘invert’ the urban condition of Times Square to create a destinational ‘centre’ and capitalise on its rare attribute as one of New York’s only urban places. To do this, they proposed a series of tiered red translucent steps rising from ground level to form both a roof for the ticket booth and an inclined public space where locals and visitors alike could pause, sit and experience the ‘crossroads of the world’. In order to give this gesture further potency, the tiered seating is lit from below causing the whole structure to glow and strengthen the presence of the booth in this visually charged context. The scheme is distilled to a singular abstract form which has visual strength whilst at the same time, allows multiple readings that give the project a greater conceptual density. For example, the scheme could be viewed both as seats or a stage to Times Square. On the one hand, having a calm grounded quality providing refuge and prospect amidst the constant flow of cars, people and media, and on the other, having an ephemeral theatric quality that puts people on stage and uplifts them to be part of the visual energy. Extending these readings further, the design can draw attention to itself while at the same time, be a foil to the energy of the place. 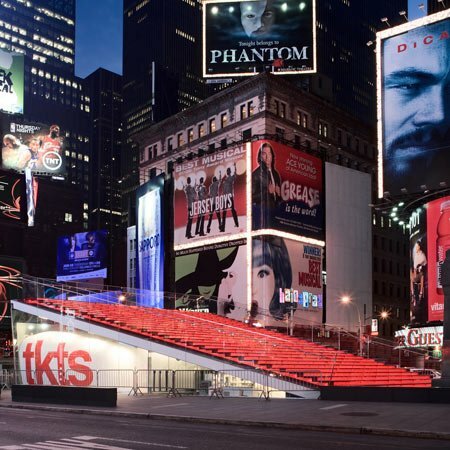 It also expands the TKTS brand but can be seen as a branding device for Times Square itself. And finally, the scheme is empowering to Father Duffy who until now, has stood stoically on the traffic island against a tide of increasing traffic and physical encumbrances that severely undermine his historical importance. Around the time of the competition, architect William Fellows had been engaged by commemorative group ‘The Coalition for Father Duffy‘ to investigate ways to restore presence to the Father Duffy monument. Their mindset at the time had been to have the nearby booth removed rather than replaced as the booth’s positioning severely impacted Father Duffy’s dignified repose. Fellows however was able to see the benefits of the winning design’s relationship to the statue and importantly saw the latent potential for a greater urban design project that would address all of Father Duffy Square and elevate its significance as the central space to Times Square. And so the Choi Ropiha scheme ultimately won the 1999 design competition because of the way it resolved several design issues simultaneously. It served the interests of various entities vested in the Square: the Theatre Development Fund (TDF) (owners of the TKTS Booth) who badly needed a new structure to provide purpose for their concession lease, The Coalition for Father Duffy who were interested in restoring Duffy’s presence, and lastly, the Times Square Alliance who’s members include business and property owners, had interests in Times Square’s economic and branding improvements. In the quest to revitalize the broader plaza context, Fellows understood the difficulties of making the plaza a people place and was acutely aware of failed efforts in the past to renew and assert the plaza’s public identity in Times Square. Whilst Duffy Square is actually a designated park, any attempts in the past to claim real space for public use have been elusive in an environment that is all about illusion and spectacle. In spite of these difficulties, Fellows was able to exert influence amongst the various stakeholders, particularly with the Parks Department and Coalition for Father Duffy, which set the ground for a more ambitious total plaza redevelopment. With all the pieces of the puzzle in place, Perkins Eastman (Principal Nick Leahy), were brought on board to progress the booth project. In the absence of further input from Choi Ropiha, Leahy’s design team developed the concept independently and brought new technological ambition to the design as a way to link the project with the forward looking attitude of Times Square. Glass would now be employed as the sole structural component for the steps and the TKTS Booth itself would be a free standing within the glass enclosure. Collaborating with Dewhurst Macfarlane and Partners, Leahy conceived of a sophisticated glass structure with technologically advanced engineering integrated within to establish a high-tech public platform at the centre of the square. Leahy focused this technology toward giving the building a restrained, understated and evenly illuminated surface. LED light sources generate the powerful even glow whilst the all glass structure minimizes any visual shadowing that could have occurred with a more conventional structural solution. A geothermal plant is integrated into the scheme for air-conditioning and is also used to heat the glass sitting surface during colder months. The combination of technological refinements establish a calmness to the project that enhances the visitor’s experience of the place. In parallel, Fellows’s plans to upgrade the broader plaza context took shape by expanding the plaza size, eliminating superfluous elements, and creating a clean plane of granite pavers. The powerful and deceptively simple design organises pedestrian movement and allows Father Duffy monument to again be accessible to the public. While the uses remain basically the same, the physical nature of the space has been transformed into a viable public space. The plaza is occupied continuously now by locals, tourists and theatre patrons and has also become an event space and was a spontaneous gathering point for the historic election of Obama. Its iconic strength has seen it become instantly part of the identity of the city and popular culture. It was featured in the film ‘I Am Legend’ even before the real structure was complete and recently it features in the music video of Jay-Z and Alicia Keys ode to New York, ‘Empire State of Mind’. The project has helped redefine the way New York views its usable public spaces and provides a novel way in which to see a building and a landscape. Even though the project is small in physical stature, it has had a transformative impact upon Time Square itself, and in the New York City context, has caused new conversations about the importance of the public realm in the making of cities. Competition: The Van Alen Institute organised competition was the largest in New York history at its time, attracting 683 entries from 31 countries. Jurors included Enrique Norten, Marion Weiss, Kathryn Gustafson, Tucker Viemeister and David Steward. Project Management Consultant: Gorton Associates Inc.
Glass Installation: David Shuldiner, Inc. Mechanical Subcontractor: Trystate Mechanical Inc.